Inspired by a true story, Woman In Gold is a drama about an Austrian woman's fight to reclaim precious family paintings seized by the Nazis during World War Two. The film is sincere and engaging, with the flashback scenes packing particular resonance. It's 1998 in Los Angeles, and the elderly Maria Altmann (Helen Mirren) lays her sister Luise to rest. Maria was born and raised by a wealthy Jewish family in Austria, but as a young bride fled to the United States to escape the Nazi occupation. In Luise's belongings Maria finds evidence to suggest that the she may be able to recover precious family paintings, including Gustav Klimt's Portrait of Adele Bloch-Bauer I, now called Woman In Gold and claimed by the Austrian government after having been stolen by the Nazis. Adele was Maria's loving aunt, and Klimt a family friend. 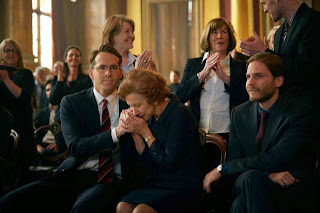 Seeking legal advice, Maria turns to young lawyer Randy Schoenberg (Ryan Reynolds), the son of a family friend and himself the grandson of the famous Austrian composer Arnold Schoenberg. Initially skeptical, Randy agrees to help upon discovering that the Klimt painting may be worth $100 million. He travels with Maria to Vienna, and they find an ally in Hubertus Czernin (Daniel Brühl), a magazine editor eager for Austria to confront her past. 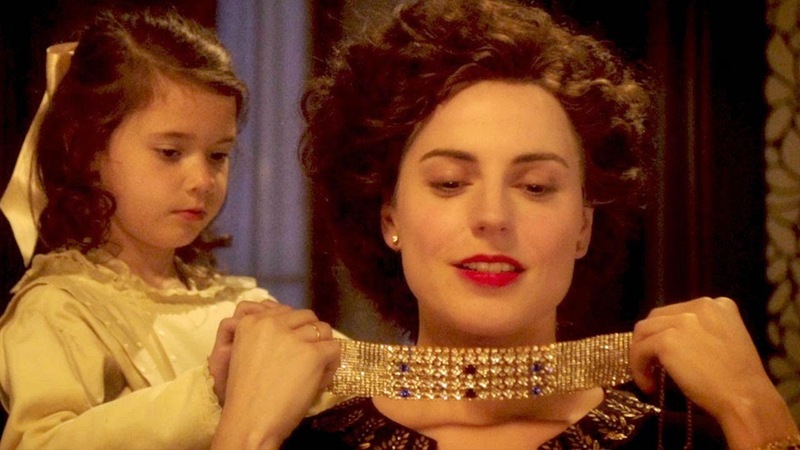 They take Maria's case in front of the Art Restitution board, but Woman In Gold is now considered a national treasure, and the government will make every effort to block Maria from reclaiming the painting of her aunt. A hybrid of Philomena and what The Monuments Men was trying to be, Woman In Gold largely succeeds in its mission to juxtapose the legal battle for personal restitution with the wider background of the horror unleashed on Austria's Jewish population. Director Simon Curtis finds a harmonious balance between the sepia-toned flashback scenes in Vienna with Maria as a young woman (played with palpable fervency by Tatiana Maslany), and the more modern day legal machinations played out on two continents. The flashbacks carry the emotional punch, capturing a Vienna torn asunder, with many residents welcoming the Nazis while the intelligentsia recoil in horror and the Jews stare at annihilation. There is less drama in the numerous but brief court scenes. This becomes more the story of lawyer Randy Schoenberg, with Maria frequently reduced to delivering quips for comic relief. Randy's passion starts with a pursuit of possible riches, but after confronting Austrian government intransigence and coming face to face with the Holocaust memorial, he adopts Maria's fight as his own personal quest for a larger justice. To liven up the otherwise staid court battles, there are moments of mild drama involving Maria having to overcome her fear of traveling back to Austria, and Randy's wife (a bright Katie Holmes performance) coming to terms with his new found commitment to a cause. Helen Mirren sparkles as only she can, and gradually steers the film towards a very personal story of recovery from the grave injustice inflicted upon her family by an evil tide of history. Curtis allows his star free reign to dominate, but then carries the emotions a bit too far into teary eyed nostalgia territory. Reynolds is better when he is likeable and skeptical, and stumbles somewhat when he needs to convey dramatic intensity. The scenes requiring him to be angry or emotional emerge as the weakest parts of the film. The strong cast is rounded out by Charles Dance as Randy's law firm boss and Antje Traue as Adele in the flashbacks, while Elizabeth McGovern and Jonathan Pryce enjoy bit parts as sympathetic judges. Woman In Gold may not fully glitter as intended, but it does achieve a steady shine.